I’ve been out of school for a while now. And I don’t have kids yet. But vintage schoolhouse-themed crafts are totally my thing, mostly because I love embracing my family’s Midwest heritage. My grandmother actually taught in many one-room schoolhouses throughout her teaching career in Nebraska in the 1940’s. How cool is that? So I decided to get into the spirit of things this season by doing a back-to-school project that can double as year-round home decor. 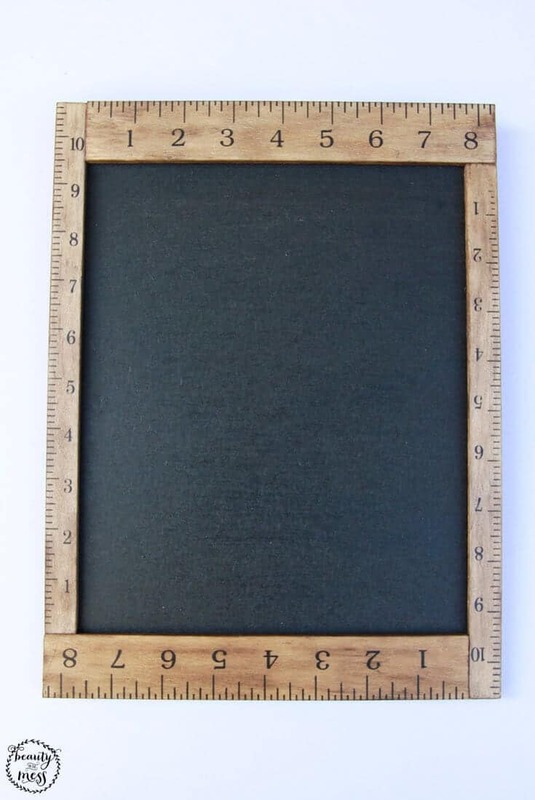 This vintage ruler chalkboard frame would be great as a teacher’s appreciation gift to start off the school year, but it can also work as a farmhouse-style decor item that can bring rustic charm to any room in your home. Keep reading to see how you can make one of these for yourself! Most of these things I already had at home, so in total I spent just under five dollars for this project! 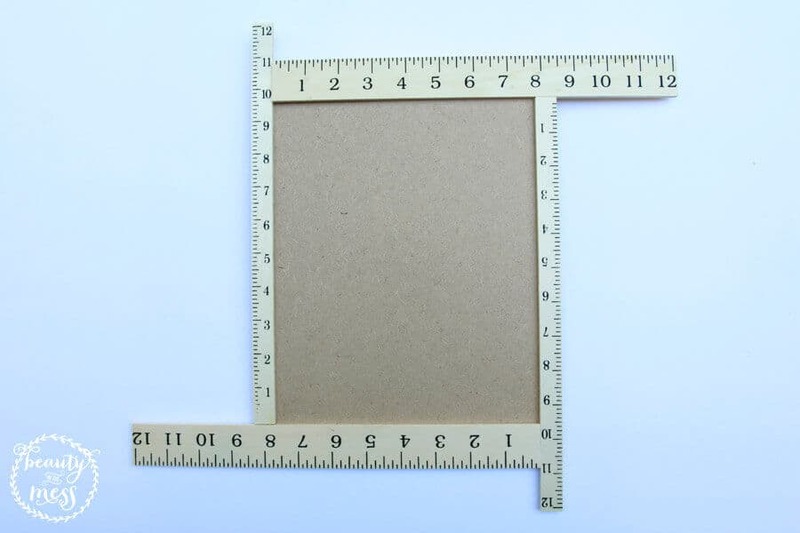 The first thing you’ll need to do is arrange each of the rulers on the back of the clipboard and mark off where you need to cut them. 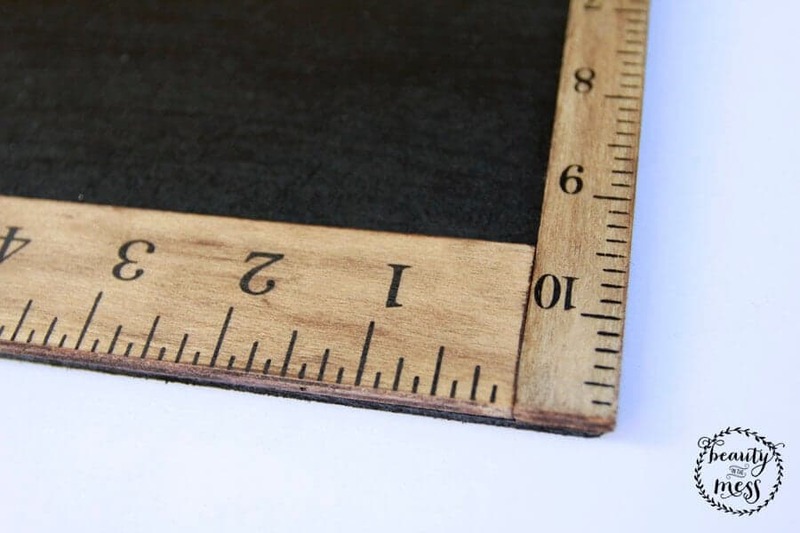 Most craft rulers can be cut with an X-Acto knife because they’re made out of a soft wood. But if you own a saw, you can definitely use it for this step too. 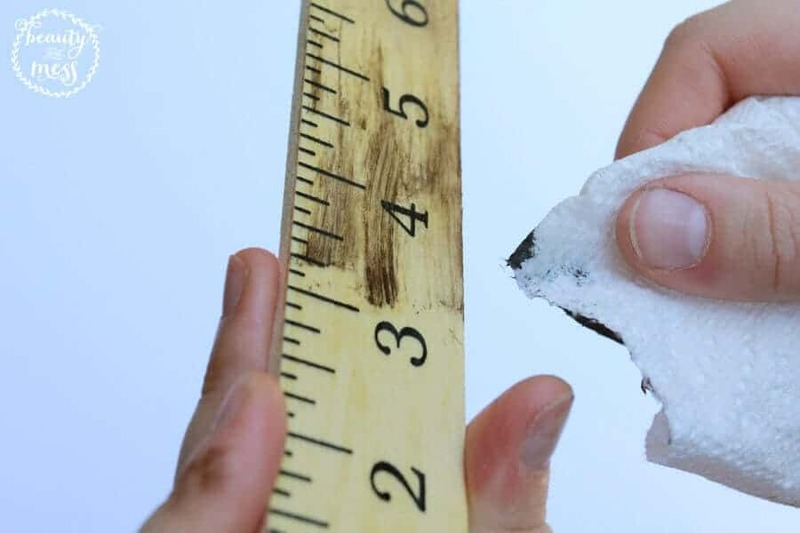 You may want to sand the end of your rulers after cutting them to make sure they don’t have any rough edges. 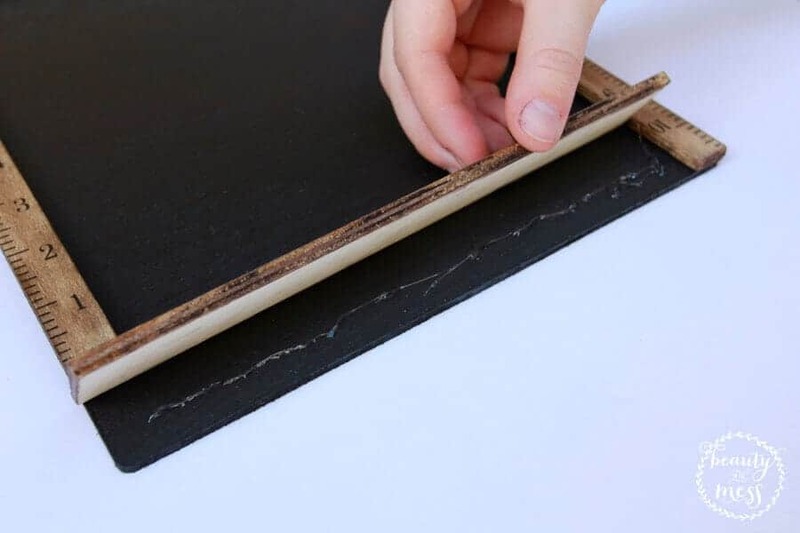 And before you move on, lay the rulers on the clipboard again to make sure they fit and that you don’t need to make any more cuts. Because I didn’t have a medium brown wood stain on hand, I opted to use two stains I already owned to get the effect I was going for. One is a very light stain, and one is a dark brown stain that would have been too dark if used on its own. I first painted the light stain onto the rulers with a small paintbrush. Then, before it was dry, I wiped on a bit of the dark stain with a damp paper towel. 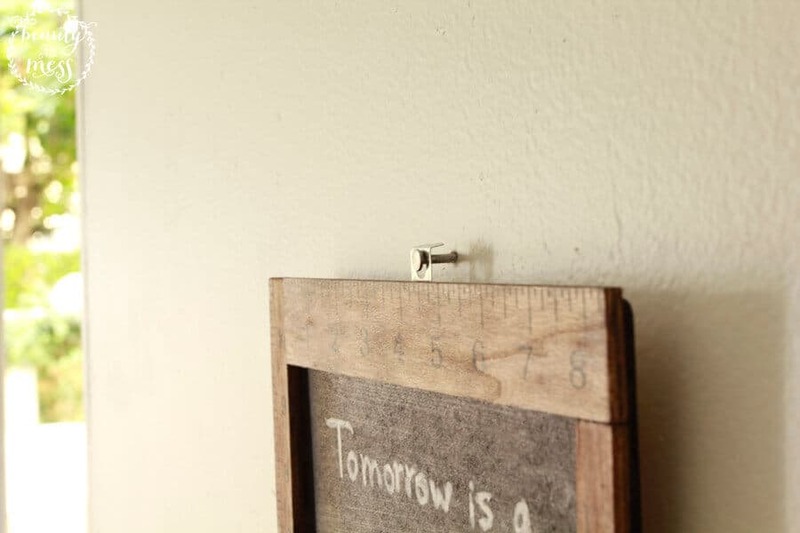 And finally, I rubbed the stain onto the ruler to blend it in. 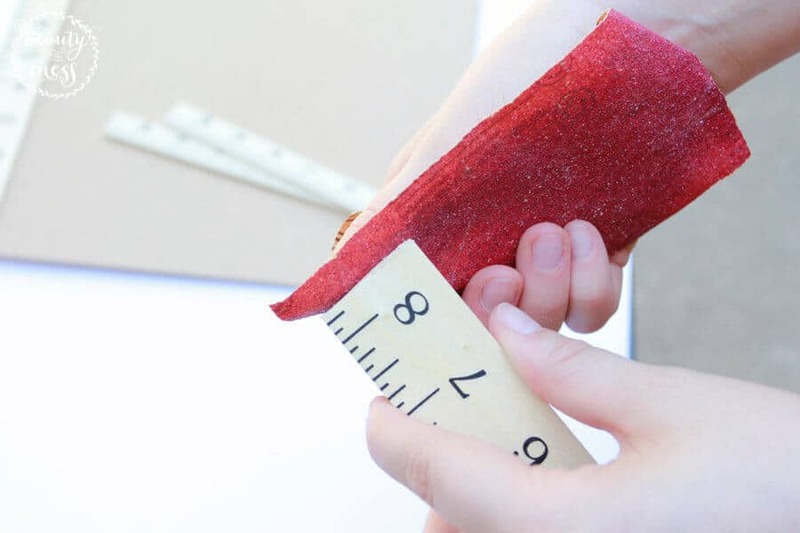 Don’t forget to do the sides of each ruler as well since they will be visible in the finished product. 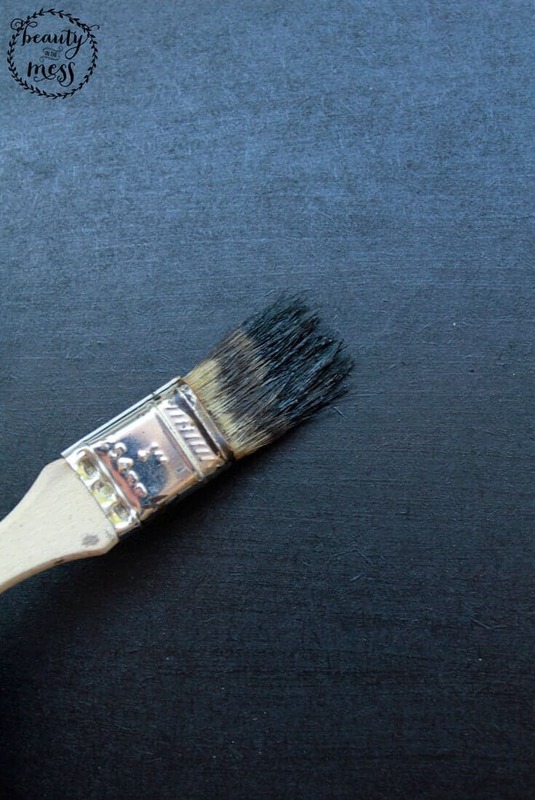 Using a standard paintbrush, I next painted three layers of chalkboard paint onto the back side of the clipboard. I waited about ten minutes between each layer just to make sure they were fully dry. 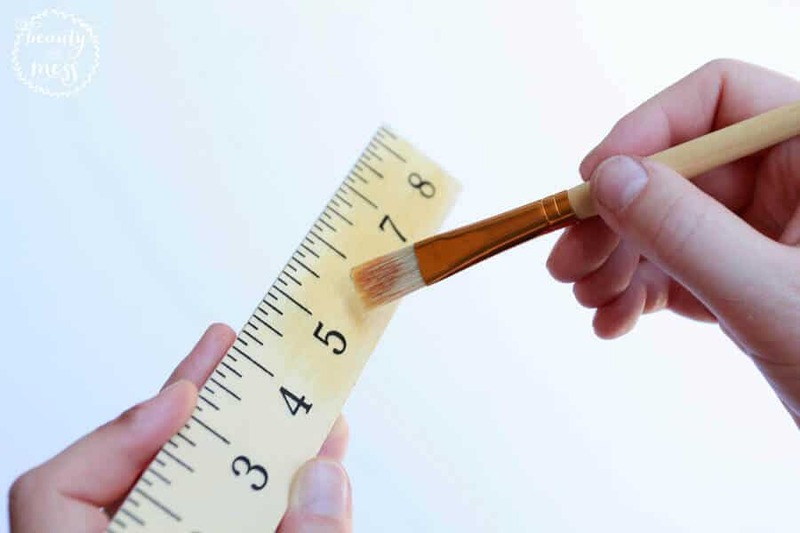 Now that your rulers are stained and your clipboard has been painted, it’s time to glue down the rulers! Make sure they are lined up with each other before you start, and then simply glue them down one at a time. This is what it should look like when you are done! 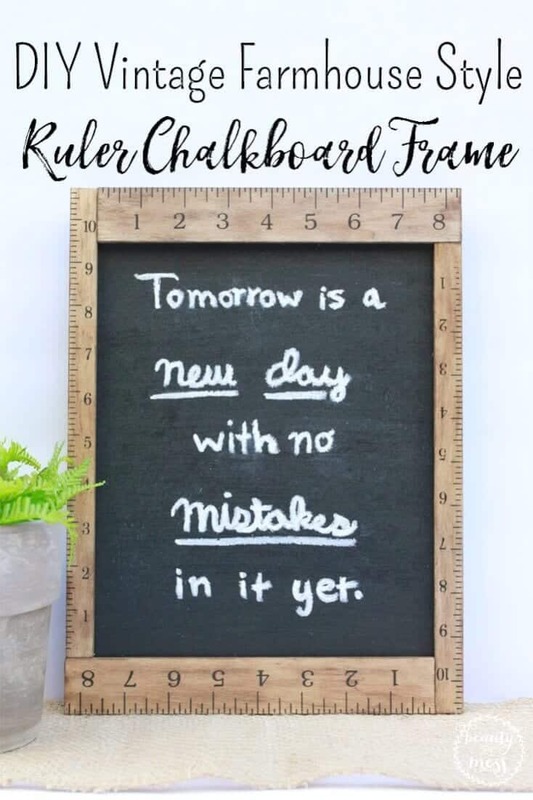 Get out your chalk (or chalk marker), and decorate your new chalkboard frame! 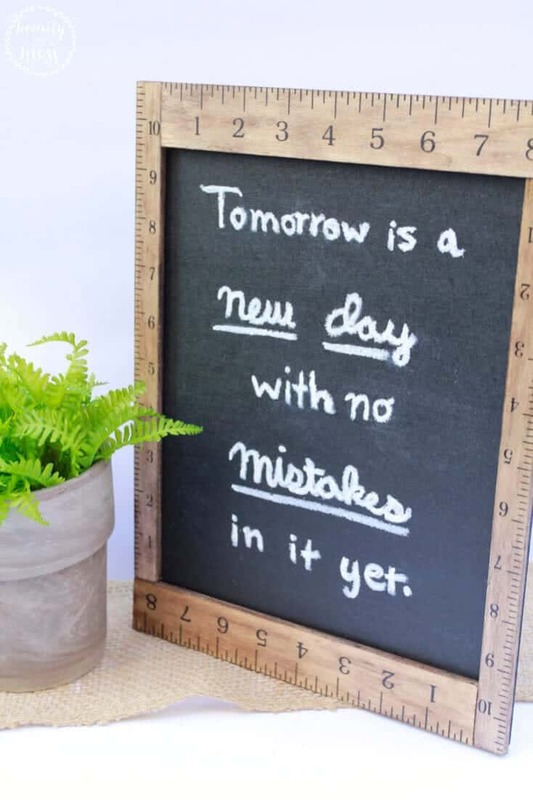 Whatever you decide to put on your frame, all you need to do to clean the chalkboard is wipe the chalk off with a damp paper towel and it will be as good as new. Oh, and one of the best parts about using a clipboard for this project is that mine already came with a metal hook for hanging! 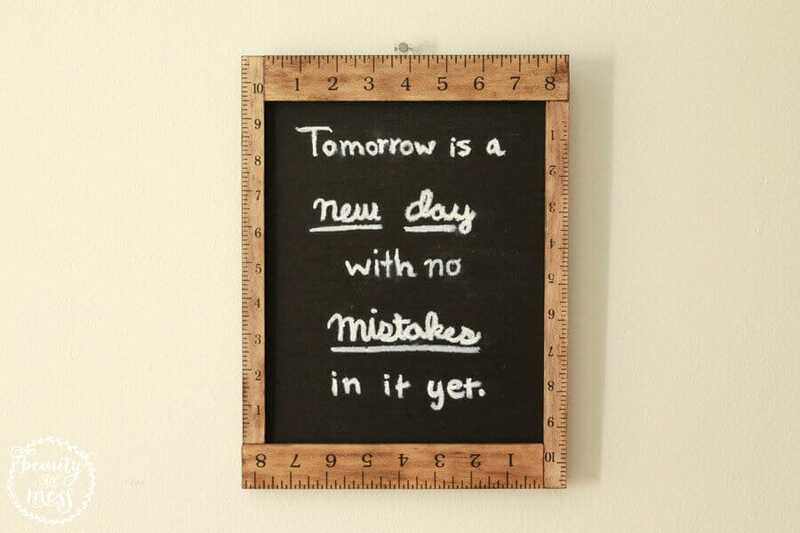 All I had to do was stick a nail in the wall and it was ready to go. 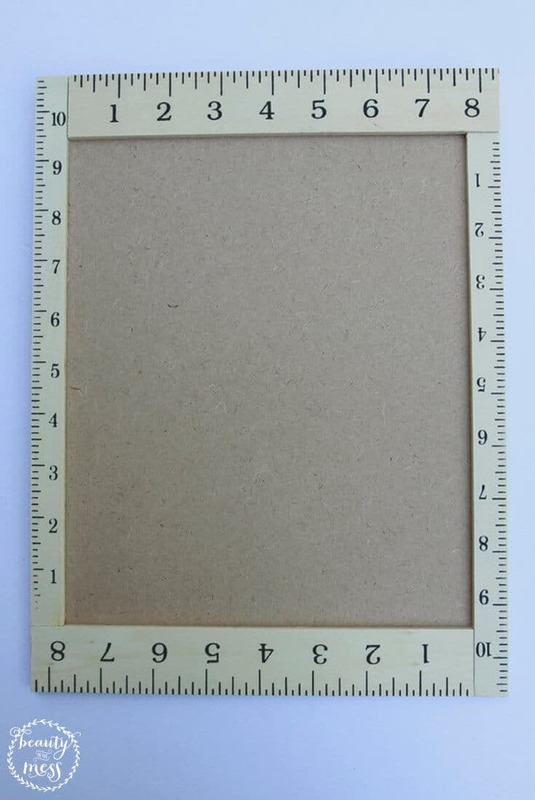 This part is totally optional though, since I think this frame would also look wonderful on a bookshelf. As I mentioned earlier, this project can be made for less than five dollars! And I could not be happier with how amazing it looks in my living room. 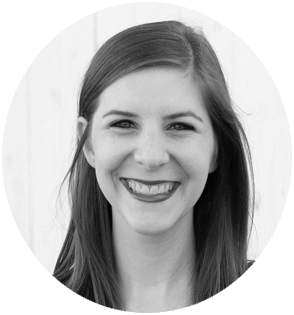 If you want to see more farmhouse style projects that I’ve done, you can find them here. 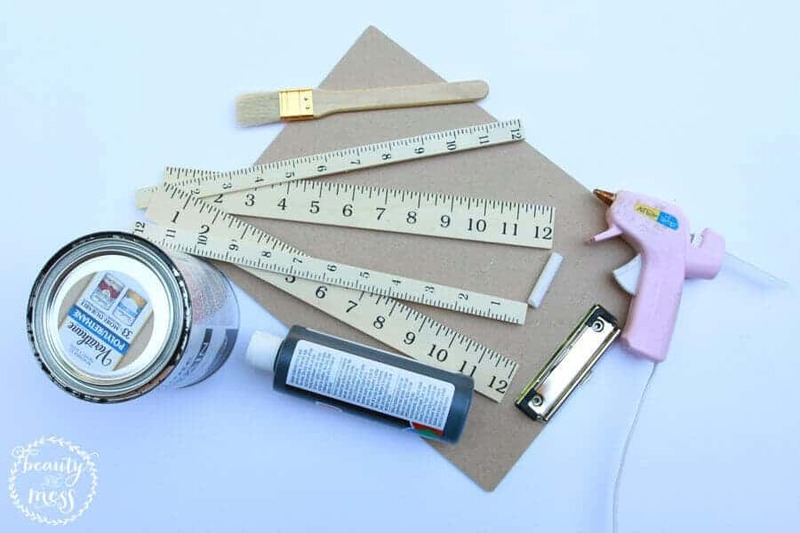 And click here if you want to read my best tips on how to save money on DIY projects. 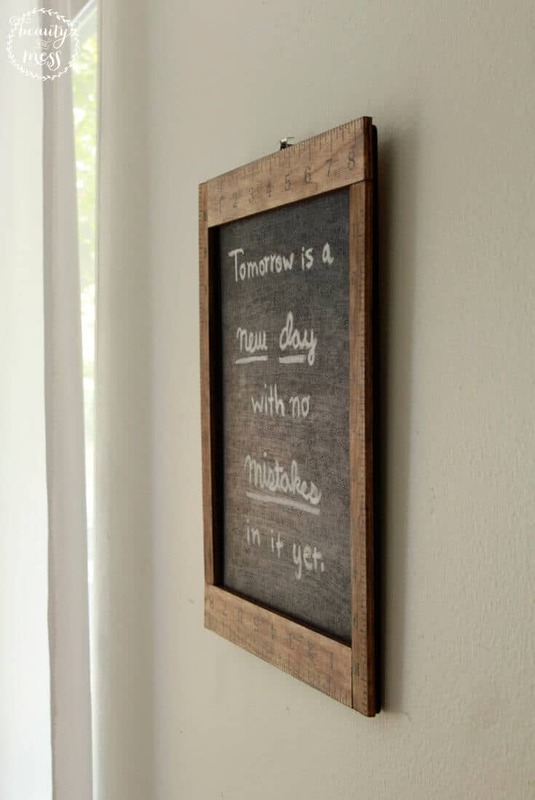 DO YOU HAVE A FAVORITE QUOTE THAT YOU’D PUT ON THIS FRAME?